We parents are vaccinated with fear and ableism from the moment we hear the diagnosis of autism, thanks to the way most professionals present this news to us. Probably the biggest detriment to autism parent advocacy has been the inability to move out of "reactive advocacy", a type of guilt driven ripple effect of all the fears and suppositions indoctrinated into us on the day our children are diagnosed and at every instant our divergent children's needs intersect with the systems meant to try and meet them. This is the legacy of the culture of hopelessnes and learned helplessness that goes hand in hand with the medical model of autism. This mental state is damaging to us, our families, and our divergent children. It is also emotionally unsustainable. In order to be successful parent advocates to our children we must not usurp their civil rights ourselves. We must assist them to self advocate and fight for them to gain a seat at any table where decisions are being made about them. For those who say that young neurodivergent children like my son, who is deeply autistic and nonspeaking, is incapable of self advocacy and self determination, I quote Kassiane Sibley, who says “ advocacy begins with No!” “No!” does not require oral language. It can be stated in action and communicated nonverbally. If my being an autism parent and saying that my son is quite neurodivergent but I must presume he is competent seem incongruous, I can say that it is not. I hold these views naturally. I am labeled as a member of five minority groups. My little brother, my older sister, and I were the first three Black students to integrate an all white elementary school in Illinois. We suffered hardship and maltreatment at a time and circumstane when racist attempts to stop the desegregation of schools still continued. But we stood our ground. To stand your ground as a child is hard. It is a lonely business. But it makes you a stronger person. I want my son to stand his ground; therefore he must see his mother standing up for him, standing by him, and by these actions I must make it clear I respect him. I want him to instinctively self-advocate before all else. I want him to know and remember children who had to be self advocating, and rose to the challenge. Children like Ruby Bridges. In 1960, when Ruby Bridges was 6 years old, her parents responded to a call from the National Association for the Advancement of Colored People (NAACP) and volunteered her to participate in the integration of the New Orleans School system. She is known as the first African-American child to attend an all-white elementary school in the South. She attended William Frantz Elementary School in New Orleans. When Ruby Bridges walked to school each day, she was pelted with rotten tomatoes; she walked past racial slurs and foul language painted in graffiti on the walls around her; crowds shrieked threats to torture and kill her and her family. Armed federal marshals, at the order of President Eisenhower, brought Ruby to and from school each day. Her mother was not able to take this walk past a certain point with Ruby. She had to do it alone. She kept her head up and did not cry. At six, she was a self-advocate of circumstance, as I was in my time and my son is now. Norman Rockwell, hearing of Ruby's courage doing this, made a life changing decision. He did not renew his contract with the Saturday Evening Post. 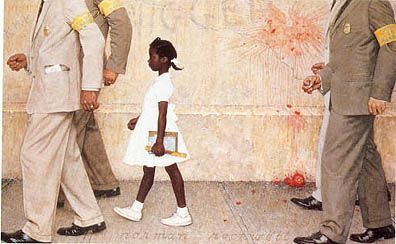 Instead he signed a contract with Look magazine, which allowed him the freedom to paint whatever he wished and he began with this painting, which tells the story of Ruby Bridges and her brave walks to school. His painting, entitled, The Problem We All Live With became an iconic image of the civil rights movement in the United States. 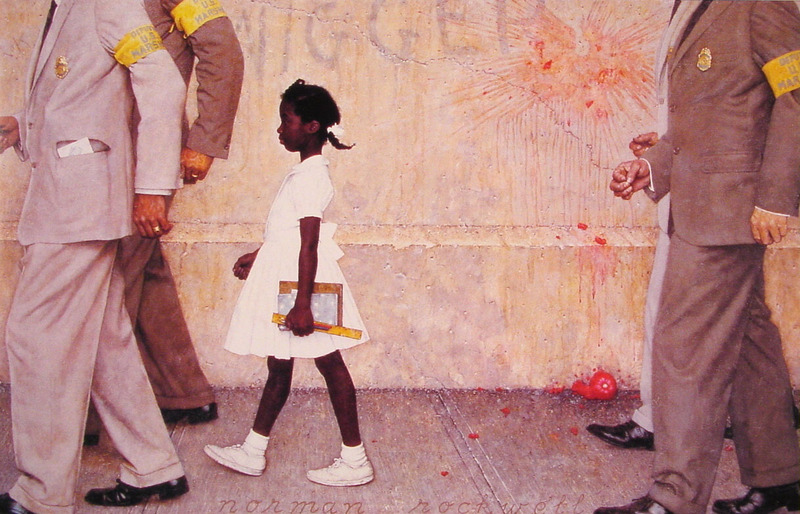 This painting is the symbol of Rockwell beginning to express his views through his art after which he began civil rights and justice themes. Norman Rockwell crossed a line. He began to use his position of privilege and his art talent to support the cause of a group he was not a member of, but whose efforts towards social justice he supported. He took steps towards becoming a civil rights ally. What do autistic disability rights advocates mean when they say the word ally? I have a brief checklist, adapted from the original by Dr. John Raible, that might give some insight into what it does and doesn’t mean to be an ally. I have made some modifications so the list might be used to clarify what an anti-ableist ally is. 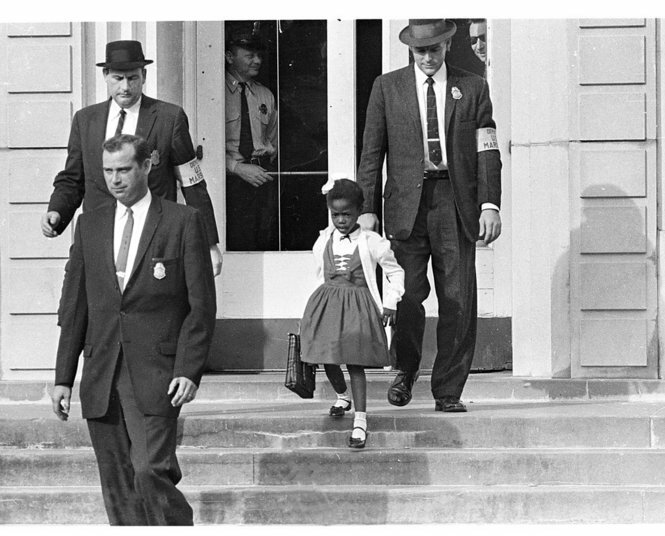 I envision the future of autism parent advocacy as the continuing process of acceptance of our own children as they are, preparing them to be self-advocates who can be as strong as Ruby Bridges was and continues to be. I hope to see parents leaving the realm of fear-based reactive advocacy, and joining neurodivergent advocates to produce inclusive, proactive. collaborative change that truly benefits autistic people throughout their lifespan. I see the brave autistic civil rights activists of today leading the way for our generation of children’s voices to be heard, and I am relieved that someone like my son echoes his voice. I am proud to stand with him in this fight, and know what my role is in it. "Nothing about my son without my son"
James Madison was a slave owner and even in death, made no attempt to emancipate the 100 slaves still in his possession. So this comment of yours here is particularly insulting to both Ruby Bridges and to me, as I am a woman of color.